Ashburn, Virginia (CNN) - The woman in charge of the secret search for a running mate for Mitt Romney made rare public comments on the vetting process itself on Tuesday. In praising the "deep bench" of Republican vice presidential potentials, Beth Myers even mentioned one name that's sure to inflame the guessing game. "One thing that is true is this year, we have a ton of qualified Republicans," Myers told a group of women voters in Ashburn, Virginia. "It is amazing. It made my job really, really hard. Because it wasn't a year where there were three people who might fit the bill." "We have a deep bench, including your governor – an incredibly able guy," Myers added, referring to Virginia Gov. Bob McDonnell. "All sorts of really great people. And I'm sure that whoever Gov. Romney decides to pick will be a great addition to the ticket." Myers is not known to make public comments about the VP search. During her speech, she used a personal anecdote to make that point clear. "Wherever I go, and its been very strange, I can't tell [anybody] - because I'm a pretty open person - but I can't tell anybody about this, at all," Myers said. "I cant tell you who we're looking at, when we're going to make this decision – other than to say that it will be before the third night of the convention, sometime between now and then." "And my children and husband are really kind of upset because they'll start - I can sort of tell they're plotting against me. And they'll have like this, dinner table, just a casual conversation, 'Gee, who would be a good VP?' And I just sit there silently." The event was specifically geared towards courting Virginia's female vote. The state, which Obama won in 2008, is a pitched battleground. Also attending the event were Tiero Cuccinelli, wife of Virginia Attorney General Ken Cuccinelli, Susan Allen, wife of GOP senate candidate George Allen, Virginia Lt. Gov. Bill Bolling's wife, Jean Ann Bolling, and Virginia Delegate Barbara Comstock. All of them made several references to the need for female support to help Republicans in November. "To win Virginia, we know that we've got to reach out to everyone. But especially to women voters," Bolling said. Bolling added: "We need to get our message out and to convince the women to vote for Mitt Romney. Democrats say that they have an edge with women voters. But I say that our challenge, as Republican women for Mitt, is to change that dynamic and to change it here in Virginia." But not all of it was pretty. Cuccinelli, the attorney general's wife, opened her comments by saying, "I just want to say, I love being a Republican woman. I don't know about you all. But I think Republican women are more intelligent, more talented and you guys are a heck of a lot more beautiful than the other side." Later, when asked by CNN to explain the comments, Cuccinelli said she meant no offense. Myers has previously worked for Romney in several stints, including as his chief of staff during his Massachusetts governorship. In her comments, she ticked off the names of women in key posts during Romney's term and in Romney's campaigns. She even used stories to play up Romney's personal appeal amid criticism that the candidate is too stiff. Myers talked about Romney's former company, Bain Capital, helping to found the office supply store, Staples. 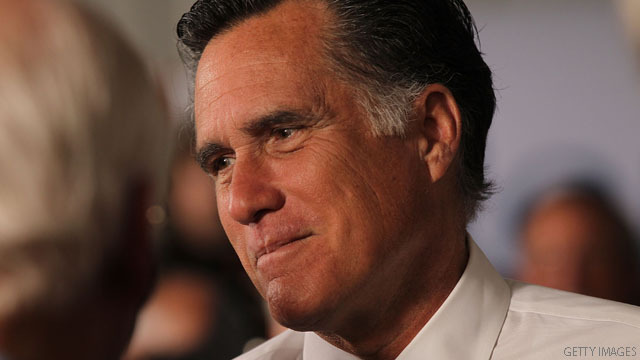 Romney "wasn't sitting up on high and sort of saying to people, 'You go do this'," Myers said. And she mentioned a video that exists showing "the day that the first Staples opened, of Mitt stocking the shelves and someone saying, 'No, no, no. It doesn't go there'." "He's the kind of guy who gets in there and gets his hands dirty." Myers also joked about Romney's sizable family, which includes 18 grandchildren. The candidate "truly is happiest around Ann [Romney] and the boys. And his grandkids," Myers said. Myers continued: "If you want to make money, bet somebody, if you go ask Ann Romney, if you see her, 'Is anyone expecting a baby?' I mean, it's a sure thing. And she'll always say, "Shhh, shhh - but how did you know?'" "How did I know?" Myers continued, referring to a hypothetical conversation with Ann Romney. "It's always somebody pregnant in your family. And they're a beautiful family." Wonderful. Nothing says "electoral college landslide" like "mandatory hoohoo probe." ""He's the kind of guy who gets in there and gets his hands dirty."" [Insert related joke about mandatory hoohoo probes here]. No one cares Robmey. Where are those taxes, long form birth certificate and college transcripts?? Show us your taxes! Nothing else matters! Americans need to know a lot more about M.R.! Romney is really scraping the bottom of the barrell if he is considering Bob McDonnell as VP. This guy's view on both minorities and women are atrocious. McDonnell believes that women should be barefooted, pregnant, and chained to the kitchen stove! "Cuccinelli, the attorney general's wife, opened her comments by saying, "I just want to say, I love being a Republican woman. I don't know about you all. But I think Republican women are more intelligent, more talented and you guys are a heck of a lot more beautiful than the other side." Is this kind of the language other fellow women should accept?? Unbelievable! Anybody would be better than the senile old fool we have for a VP now. Obama should be disqualified for having this buffoon on the ticket. He really blew it. He should have swapped Biden out for Hillary. Too late now, but he'll be kciking himself come November. Then again, I doubt Hillary wanted to play second fiddle to this incompetent community organizer. Do these Republican women have any idea just how stupid and insipid they sound? All of that "southern belle charm" is nothing but a crock of phoney baloney. YUCK!!!! I thought he said "Christine O'Donnell. The republican women are about the stupidest ive ever seen and heard. They follow their husbands around like they have no brains and continually take the back seat on all issues of life.Guess what people the Mormons are NO better. They believe women have NO say about when they have children and how many they have. That is the decision of the MAN. He says whats going to happen and when it's going to happen.Just because Ann Romney looks good and dresses nice and speaks out on T.V. aggressively means nothing. Her husband tells her what to do and his campaine Mgr gives hre the words to use. wow is that embarrassing. and the rest of us women voters are supposed to identify with these women? no thanks but you all just keep talkin'. some of us have real things to do.